There are more and more demands that not only the initial assignment of an authorization to a user needs to be documented and auditable, but the exiting assignments need to be periodically reviewed. Without adequate tools, this is cumbersome, time consuming and error prone. 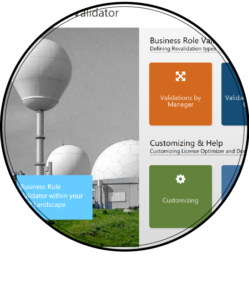 SUIM Business Role Validator enables you to periodically review the assigned roles by the role owner or the manager. As it is fully automated, the process is efficient and consistent. If a validation is refused, the corresponding authorization can either be removed directly or a deletion request can be sent. The role owner reviews all assignments of roles for which she is responsible. The periodicity is defined in the validation period for role owner validations. The manager reviews all authorization assignments for her direct reports. The periodicity is defined in the validation period for manager validations. For each validation type, a periodicity can be defined. For instance, the review for role owners would be during 20 days every six months whereas the review for managers would be during 15 days once per year. Each and every validation action such as period opening and closing, accepance and refusal of authorizations is recorded in within BRV logs. Furthermore, any changes to roles as a result of a refused validation is recorded (including text) in the AM / AMSO actionlog as well. The easy and ergonomic interface options for managers and role owners increases user satisfaction. The included mass maintenance options and reporting (included transactions, risks) further increase efficiency for an effortless revalidation process. For each validation type, the validations can be executed either be by workflow or by the workplace. The content of a business role, meaning the roles and other authorization elements contained within, can be reviewed. BRV is fully integrated into SUIM’s AIM Suite, thus reducing implementation effort.